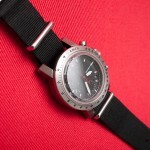 How Robust is a Automatic Chronograph? I did a unintentional Drop Test. I recently put the Kazimon DREI chronograph on a NATO strap because it’s more comfortable to work out in and swim in. I was pushing the watch up my arm a bit because it traveled down. That’s when the buckle failed and the watch dropped about 20-30 feet onto hardened steel grates while the chrono was engaged. The watch is still running fine amazingly enough except for the chrono reset. There’s a small knick on the bezel as you can see in the photo. I was a bit shocked, if I fell that distance onto hardened steel grates, I probably would have broken a bone. What is broken is my confidence in NATO straps. I can see why NASA uses velcro. The DREI uses a “Top” grade ETA 7750 movement and if it can survive this sort of fall, I have no concerns about the shock resistance and hardiness of ETA movements. Fortunately I do have some insurance on the watch and it should be covered for accidental damage. I’m very impressed by the build quality of the DREI and that it took the fall in stride, chrono still going and it seems to still be keeping time fine. Good to hear that the Kazimon survived such a dramatic fall with flying colors. Something I noticed in this picture and your review: the tachymeter scale is explicitly marked km/h, which while charmingly metric and perhaps emphatically German, is a bit amateurish. After all, the chronograph tachymeter is just a fixed conversion of elapsed time in seconds per generic unit to units per hour, and does not vary depending on the unit involved. 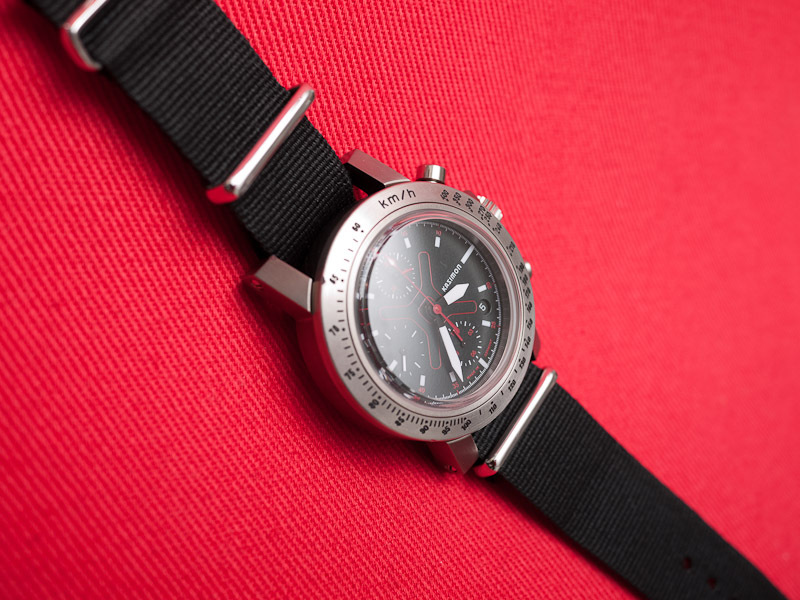 The Speedmaster gets this right, marking its bezel with only “tachymeter”, since it is the same scale regardless of if you’re measuring miles/hour, kilometers/hour, or even liters per hour (when determining flow).